In celebration of fall, we’ve put together our list of six super foods of autumn that will also help to slim down. We’ve included foods with a high fiber and/or water content that will keep you full for longer, helping you to reduce cravings. 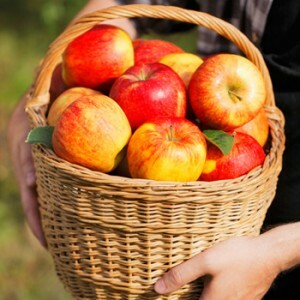 An apple a day keeps the doctor away — and it may help keep those fat cells away too! Versatile, portable and delicious, apples can be one of your secret autumn weight loss weapons. Full of flavor, apples are also great sources of hunger-fighting fiber. Snack on one large apple (with the skin) for 116 calories, and you’ll consume 5.4 grams of fiber. The high water content and amazing amount of fiber will keep you full until your next meal, curbing hunger, and preventing the temptation to reach for a high-calorie nibble. Apples are the perfect anytime-snack. I also love them in oatmeal and salads. For a lower calorie sweet treat try this amazing Cinnamon Apple Crisp from our friend Chef Gina at SkinnyTaste. Pumpkins aren’t just for Halloween! Pumpkin is also a nutritional powerhouse. A cup of cooked pureed or mashed pumpkin contains just 50 calories, 2 grams protein, 3 grams fiber, 2.5 grams natural sugars and is loaded with vitamins, minerals and phytonutrients. 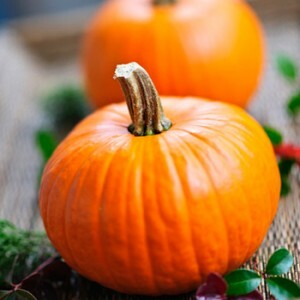 Pumpkin provides vitamin C, iron, zinc, potassium, and are among the best sources of vitamin A in the form of beta-carotene and several other carotenoids. Since most of us fail to get enough deep orange veggies in our diet, the new dietary guidelines emphasize the importance of getting 5-6 servings a week of red or orange veggies for their anti-cancer, anti-inflammatory and heart health benefits. And the fiber in pumpkinwill fill you up, not out. There are endless ways to use pumpkins in your meals this fall. Add chunks of pumpkin to chili, stir pumpkin puree into tomato-based pasta sauces, or of course, use pureed pumpkin for your pumpkin pie. Try our Light & Delicious Pumpkin Pie recipe! The sweet flesh of pomegranates provides vitamin C, potassium, and B6. Pomegranate juice also provides these nutrients. Look for domestic pomegranates from September though January. Pomegranate juice is great for making sauces and marinades. And the whole seeds are perfect for sprinkling on salads and desserts. Try this Mixed Baby Greens & Pomegranate salad. Dates are low in fat and high in fiber. Just 1 date has 1.6 grams of fiber in fact. Dates are available in both fresh and dried form. Look for ones that are smooth-skinned and plump and that yield to pressure. They should not be rock hard. Although dates are available year-round, they are harvested in late fall and early winter. Dates are a wonderful addition to yogurt, shakes, and salads. We also love to make our own Homemade Energy Bars with them. Definitely try this recipe! Butternut squash is another fantastic fall superfood. Inexpensive and versatile, you can use them for soups and stews, or roast or mash them as a delicious side dish. 1 cup of baked butternut squash has just 98 calories, 2 grams of protein and a whopping 6.9 grams of fiber! Plus it’s deep yellow-orange flesh is an excellent source of disease fighting beta carotene, a powerful antioxidant. This rich, Roasted Butternut Squash soup will warm you up on chilly fall and winter days! While oats are perfect for any season, I wanted to add them to our fall super foods list because oatmeal is an ideal breakfast for cooler autumn mornings. Plus oats are inexpensive (less than 25 cents per serving!) and loaded with filling fiber. A cup of cooked oats has about 4 grams of fiber — that’s about 16 percent of the total you need each day. Research shows that the fiber in oats may also help control blood sugar and lower cholesterol. In addition to oatmeal, you can also use oats for soups and stews. The finer cuts will thicken the liquid. You can also add oats to burger and meatloaf mixtures to “extend” your recipes.